Ancient Greeks in the River Plate! A "Phoenician" rock inscription in the south of Brazil. We have already written about the Phoenician inscriptions on the Pedra da Gavea, at Rio de Janeiro. They are not the only ones in Brazil. 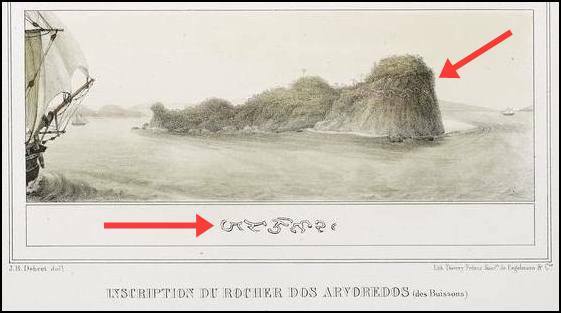 Thera are more: according to an article published in 1829 , there are Phoenician inscriptions at the mouth of the Amargoso River, in Rio Grande do Norte (though the article does not describe them), and it also mentions those at Arboredo. Arboredo [sic], whose alleged Phoenician characters are deeply etched and measure no less than 40 feet [12.2 m] tall and can be seen from half a league away at sea. This crag, a rugged rocky island, is known, in Portuguese as the “Rochedo dos Arvoredos” (or "rock of the groves"). It is located at a short distance from the entrance to the Bay of Santa Catarina, in southern Brazil. The island, now known as Ilha do Arvoredo(27° 17'S, 48° 21'W), is located about 12 km north of the large Island of Santa Catarina, where Florianopolis, the capital of the state of Santa Catarina is located. It was depicted by the French artist Debret,  and his painting shows the characters. The image’s caption says that it “has an inscription in Phoenician characters very similar to others noted by Humboldt around America.”. (I should look up what Humboldt wrote about the Phoenicians in America!). "Phoenician" inscriptions on the Rochedo dos Arvoredos, Santa Catarina, Brazil. Arrows show the inscriptions and a detail of them. Image by Debret . Interestingly, Santa Catarina was during the period of conquest and discovery of South America, a key port, from which the Spaniards reached Asunción in Paraguay, by cutting across Santa Catarina (Brazil), Misiones (Argentina) and eastern Paraguay. It was shorter than going through the River Plate and Paraná and Paraguay rivers. Sebastian Cabot and Sol&is (who discovered the River Plate) were shipwrecked there. It is likely that Phoenician sailors, moving south along the Brazilian coast would have found a safe port here. It also conforms to their chosen layout for settlements: a coastal island close to the shore with a well protected harbor. Santa Catarina Island is just like that. Check out latest on phoenician gene identified around the Med. Could this test be done in SA? Maybe yes, I have got some studies done in Brazil, but there may be some difficulty since Phoenicians visited Spain and what is now Southern Portugal... how can we separate direct Phoenician input in SA from the indirect genes from America's Spanish and Portuguese colonizers? Nevertheless I will look into it.